The SugarHouse Casino in Philadelphia was the host site for a King’s Promotion 9 fight card. Young Philadelphia talent were featured in the main event, which ended in a draw between Tyron “Butterfly” Crawler, Jr. of Philadelphia and Dominican Richard Garcia over 8 rounds. Philadelphia, PA, and Dominican Ricardo Garcia, 14-3-1 (9), of Reading, PA, fought a rather sloppy 8 round draw for the WBF Junior Welterweight title, over 8 rounds. Representing the WBF was Greg Hackett, Sr. In the first two rounds Crawley used a good jab and hand speed but showed little power as Garcia was the stronger of the two. In the third round Crawley out boxed Garcia for the most part. In the fourth round Garcia came out throwing bombs pinning Crawley against the ropes on several occasions. In the fifth round too much holding started. Garcia was warned several times by referee Eric Dali. In the sixth round it was more of the same with Crawley busier with light punches and Garcia throwing harder punches when he landed. In the eighth and final round with the fight on the line it looked like Garcia may have caught up to Crawley if not taking the fight. Scores were Dewey LaRosa 79-73 for Garcia, Dave Braswell and Alan Rubenstein 76-76 as did this writer have it. It was a good show but the main event didn’t live up to main event status. The fans seemed well pleased overall and were into most of the bouts. In the co-feature Super middleweight Christopher “Ice Cold” Brooker, 13-6 (5), of Philadelphia, lost a hard fought decision to Eric Moon, 8-1 (6), of Marietta, GA, over 8 rounds. In the first round Brooker was the aggressor and won the round. In the second round Brooker pinned Moon against the ropes but got hit with a right hand to the chin backing him up. The fight is going back and forth. In the third round of a close round Moon is giving as much as Brooker is giving. In the fourth round Brooker outfought Moon in a close round. In the fifth round it went back and forth with Brooker having an edge. In the sixth round Brooker pushes Moon against the ropes until Moon spins out. Brooker is making the fight while Moon lies back like a rattlesnake throwing occasional bombs. He landed one in this round rocking Brooker with a right to the chin. In the seventh round Booker rocked Moon with a right to the chin. Moon would come back later in the round holding his own. In the eighth and final round with the fight on the line Moon seemed to pull it out. Scores were Braswell 78-74, LaRosa and Lucend 77-75 as did this writer. The referee was Shawn Clark. Welterweight southpaw Poindexter “Savage” Knight, 5-0 (2), of North Philadelphia, won a lopsided decision over Greg “Spider” Young, Jr., 4-1 (1), of Hoover, AL, over 6 rounds. In the first round while Young was bouncing around the ring Poindexter was landing punches in bunches. Young missed with a punch and ended up halfway through the ropes. It was all Knight in the first. In the second round Poindexter rocked Young with a straight left to the head. Young fought the first round southpaw but came back orthodox in the second but it didn’t make any difference as Knight continued pounding him with body and head shots. In the third round Young did some showboating but little fighting as Knight took him to school as he did in the fourth round. In the fifth round Poindexter continues to give Young a boxing lesson as Young clowns around. Poindexter dropped Young with a right hook to the chin. Upon getting up Poindexter was all over him as the bell rang but the fans were cheering so loud it was hardly heard until referee Eric Dali stepped in. In the sixth and final round Poindexter came to finish him off as Young tried standing his ground knowing he is so far behind in the scoring. Poindexter landed a crushing right hook rocking Young as the fight ended. Scores were 60-53 by LaRosa, Braswell and Lucend as did this writer. Eric Dali was the referee. Poindexter is managed by one of the best in the business in David McWater who has close to 60 fighters. Super featherweight Puerto Rican Javier Oquendo, 3-1 (1), of Philadelphia, was stopped by Puerto Rican Joshafat “Truth” Ortiz, 5-0 (3), of Reading, PA, at 2:06 of the third round in a scheduled 6 rounds. In the first round Ortiz out worked Oquendo who was looking for the one punch. In the second round a fight broke out as Oquendo mixed it up with Ortiz who had been dominating up until the middle of the rocked him until he fell. He was in no condition to continue when he got up forcing referee Shawn Clark to wisely halt the fight. Welterweight “Sugar Sheed” Rasheed Johnson, 4-2 (1), of Willow Grove, PA, defeated southpaw Tony “Ton Ton” Morris, 4-2-1 (2), of Jacksonville, FL, over 6 rounds. In the first round both using effective jabs until Johnson landed a left hook to the chin of Morris. In the second round Johnson chased Morris down landing a combination to the head. Morris didn’t stop long enough to land but a few punches as Johnson got in his licks. In the third round both landed in an exchange of punches. Twice there was a clash of heads making referee Dali call in the ring physician due to Morris suffering a cut and swollen left eye. Morris charges in when he isn’t running walking into Johnson jabs and right hands to the chin. The ring physician came into check Morris. In the fourth round Johnson landed several rights to the chin of Morris. Re-opening the cut and using his jab to take the round. In the fifth round Morris stepped to his left and walked into a Johnson right hand to the head. Johnson keeps working the cut. In the sixth and final round Morris landed his best punch a lead left to the chin of Johnson. Johnson keeps using his jab peppering the face of Morris. Scores were Lacend, Rubenstein and LaRosa along with his writer 60-54. Referee was Dali. Welterweight 2016 Olympian Paul “The Punisher” Kroll, 1-0 (1), of Philadelphia, made his debut a knockout over DeAngelo Alcorn, 0-2 (0), of Searcy, ARK, at 2:33 of the first round in a scheduled 4 rounds. In the first round Kroll came out looking for an early knockout. Midway through the round Kroll rocked Alcorn with a left hook to the chin. Kroll landed a flurry of punches ending with a right to the chin knocking Alcorn out. Referee was Shawn Clark. “I feel great. The two year layoff helped me mentally and physically,” said Kroll. He is trained by Dirk Gooden aka “Grasshopper”. 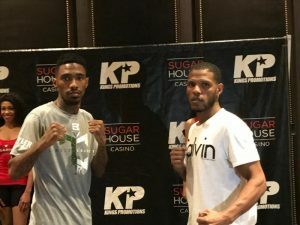 Super bantamweight southpaw Rasheen “Sugar Sheen” Brown, 1-0 (0), of Philadelphia defeated southpaw Puerto Rican Bryann Perez, 2-11 (2), of Dallas, TX, over 4 rounds, in a spirited fight. In the first round it was all Brown landing jabs followed by uppercuts from both hands. In the second and third rounds Perez was coming forward working the body of Brown when he can reach the elusive one who had too much hand and foot speed countering well. In the fourth and final round Perez waved Brown in to stop running. When Brown stood toe to toe it was a brawl between both southpaws. Brown ended the last 30 seconds giving Perez a boxing lesson. Perez was a late sub. Scores were 39-37 Lacend and 40-36 Braswell and Rubenstein and this writer. The referee was Eric Dali. In Browns corner was Buster Custus. Super welterweight James “No Games” Martin, 2-0 (0), of Philadelphia, defeated in a hard fought fight “The Prodigal Son” Jonathan Burrs, 0-1 (0), of Hagerstown, MD, over 4 rounds. In the first round a Martin right hand buckled the knees of Burrs making him grab Martin into a clinch. Burrs came back and both fighters let it all hang out the rest of the round. In the second round both fighters never stopped punching in an action packed round. In the third round Martin landed combinations as Burrs was landing one punch at a time. Martin landed a double right to the chin of Burrs followed by a left hook to the chin. Seconds later Burrs came fighting back. In the fourth and final round Burrs landed a hard right to the chin of Martin who came right back with a left hook to the chin of Burrs. Martin was getting the better of the non-stop action. Scores were 40-36 Braswell, Rubenstein and LaRosa and this writer. The referee was Shawn Clark. In Martin’s corner was “Bozy” Ennis. Heavyweight Jamaican southpaw Nicoy Clarke, 2-1 (0), of Jersey City, NJ, won a majority decision in a brawl over southpaw Jose Nunez, 0-1 (0), of Reading, PA, over 4 rounds. In the first two rounds Clarke was out punching Nunez and they could have fought in a phone booth. In the third round Nunez was getting his punches in as Clarke may have punched himself out. In the fourth and final round both fighters were slugging it out at various points each got staggered. Scores were 40-36 LaRosa, 38-38 Braswell and 39-37 Lacend same as this writer. Eric Dali was the referee.